English Summer fruits have been in abundance this year along with the sunshine. English cherries have been no exception. This rotund juicy berry not only looks beautiful but packs in a fantastic flavour. Being either sour or sweet means the different varieties can be used in savoury or sweet dishes. Just make sure you get the right variety as the sour ones do need cooking (most green grocers will let you try before you buy). Cherries contain high amounts of vitamins and antioxidants but for me its the flavour that counts meaning you can easily eat one of your five a day. I like cherries from the fridge, de-stoned, just before you eat them to avoid them going brown. They eat beautifully with many flavours, such as almond, orange or vanilla, but are just sublime with dark chocolate. 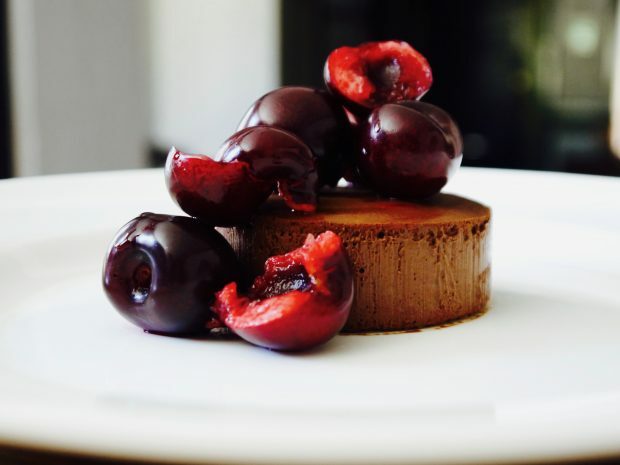 This easy recipe for chocolate ganache, which can be made in advance, is fantastic with sweet cherries or any other soft fruit that you love to eat with chocolate!! 1. Line the bottom of a baking tray with parchment paper and put 6 small rings too it. 7 Stone the cherries and arrange on top of the ganache before serving.